The MissionCritical product line is ideally suited for critical computer applicationsrequiring rugged rack mount, fixed mount or portable construction, high reliability, andcompact size design. Internally, all major components are well secured and electricallyinsulated to prevent damage due to shock and vibration. Controls and protective devicesare brought to the front control panel which is recessed to prevent damage or accidentaloperation. The ETI0016-C1 series computer chassis is a flexible design that can beconfigured with various motherboards, drives and power supplies. Internally the chassiscan accommodate AT and ATX motherboards as well as passive backplanes. Internal restraintslock any option cards in place to securely withstand shock and vibration. Additionallyeach drive bay is shock mounted within the chassis. Three half height devices withremovable media can be accessed from the front via a hinged, latching door. Additionalinternal drive bays accommodate full, half of slim height devices. The universal inputselects from either domestic or international voltages automatically. The control panelthat is recessed to prevent accidental operation, can be configured including LED arrayskeep the operator informed as to the power and activity status of each device. Both frontand rear keyboard and mouse jacks are available to facilitate cabling. The ETI0014-D4 line, Navy Standard product, incorporates four full height, shockmounted, mass storage bays each powered by redundant power supplies. Each bay can havemounted either one full height or two half height or three slim height devices. The frontpanels provide access to either two full height or four half height devices with removablemedia. The input automatically selects from domestic or international voltages. The LEDarrays keep the operator informed as to the power and activity status of each device. Theinput switch, fuses and wiring provide double pole isolation for shipboard systems. Therear panel provides four interface panel positions for all standard SCSI connectors thatcan be mixed and matched to suit a particular configuration. The ETI0014-D7line accommodates eight half height, mass storage bays powered by redundant powersupplies. Each bay can have mounted either one half height device or one half heightremovable device shuttle. Since all eight half height devices are accessible from thefront, each can have removable media such as tape cartridges, CD-ROMs, or optical drives.The universal input selects from domestic or international voltages automatically. TheLEDs keep the operator informed as to the status of each power supply. The input switch,fuses and wiring provide double pole isolation for shipboard systems. The rear panelprovides four interface panel positions for all standard SCSI connectors that can be mixedand matched to suit a particular configuration. The configuration shown was selected forthe Navy Q-70 program. It incorporates six device shuttles, both 50 pin SCSI and 68 pinfast-wide SCSI buses, plus an auxiliary DC output for remote drives. The ETI0014-D8 line was originally developed for the new Navy submarine program, NSSN.It accommodates eight half height, mass storage bays powered by redundant power supplies.Each bay can have mounted either one half height device or one half height removabledevice shuttle. Since all eight half height devices are accessible from the front, eachcan have removable media such as tape cartridges, CD-ROMs, or optical drives. 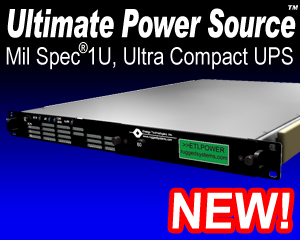 Theuniversal input selects from domestic or international voltages automatically. The LEDskeep the operator informed as to the status of each power supply. The input switch, fusesand wiring provide double pole isolation for shipboard systems. The rear panel providesfour interface panel positions for all standard SCSI connectors that can be mixed andmatched to suit a particular configuration. The configuration shown incorporates sixoptical drives plus pre-equipped for two future devices, a standard 50 pin SCSI bus, andSCSI ID selector switches for all eight devices. This unit also has the unique feature ofhaving a hinged front door that seals out water or dirt and seals in EMI when closed! Thisfeature is available on certain other ETI products as well. Energy Technologies manufactures a wide variety of rugged Computer andPeripheral products due to the modularity of the product line and the diverse requirementsof our clients. MissionCritical Rugged Rackmount or Universal Mount Disk Expansion Units (DEU) or Mass Storage Units or Redundant RAID Units. MissionCritical Rugged Rackmount or Universal Mount Computer Chassis.